Same day teeth with dental implants (or All on 4) is a technique that uses four dental implants in restoring a full arch of teeth (either the lower or the upper arch). This method of placing the implants is less-invasive compared to a traditional dental implant treatment, making it possible for the treatment to be completed without the need for complicated procedures – such as bone grafting – even if there if the jawbone structure is considered inadequate. Also called same day teeth or same day implants, the all on 4 method enables you to enjoy a brand new smile in just a single dental appointment . You can enjoy the benefits of an implant treatment (with a fixed bridge or dentures) after just one visit to the dentist, with all on four dental implants. What is involved in All on Four Implants? 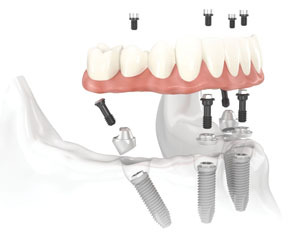 The all on four implants technique makes use of four dental implants, which are positioned specifically inside the mouth to maximise the existing quality of the jawbone; this eliminates the need for advanced techniques such as bone grafts. The implants are then attached to teeth restorations such as a fixed bridge, and can also be used to provide a firm base where dentures can be anchored to. The result is a brand-new smile that can be fully enjoyed without the need for a healing period to be finished, after just one dental appointment. Who Can Have Same Day Teeth with Dental Implants (All on Four)? The same day teeth with dental implants (all on four) method is ideal for those who want to secure removable dentures, which have a tendency to move around in an uncomfortable and embarrassing way inside the mouth. The dentures are held securely in place by the implants, which are in turn firmly anchored to the jawbone. Same day teeth with all on 4 implants prevent the dentures from unwanted movements, which often lead to severe discomfort and embarrassment. All on four dental implants are also suitable for those who have lost all teeth in a specific arch – the lower or the upper arch, or both – especially in cases when the jawbone structured has been compromised and is considered as insufficient to hold conventional dental implants. What are the Advantages of Same Day Teeth with Dental Implants (All on 4)? All on four implants can immediately be used after they are placed. Improved smile form and function can be enjoyed after just one visit to the dentist, without the need to wait for a specified healing period to be finished. The permanent teeth restorations (a fixed bridge or a set of dentures) are immediately attached to the implants within the same day. 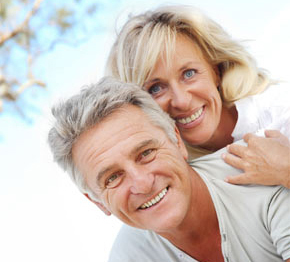 You can enjoy all the benefits of dental implants within the same day that they are loaded! The procedure for placing same day teeth (with all on four implants) is minimally-invasive, eliminating the need for a more complicated bone grafting procedure even if the jawbone quality has been compromised, because the implants take advantage of the existing jawbone structure. The minimally-invasive technique used for this implant treatment results to less patient discomfort, a shorter recovery period, and less trauma. The cost involved in an all on four implant treatment is less compared to a traditional implants treatment. This reduction in the overall cost is because of the minimally-invasive technique that eliminates the need for more advanced procedures; the cost is also reduced because there is no need to visit the dentist numerous times for the treatment to be completed – as the implants are placed and completed in just a single dental appointment.